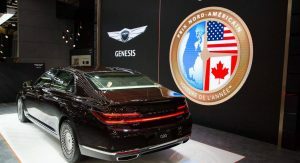 Following its global premiere in Korea in November last year, the facelifted 2020 Genesis G90 made its North American debut not in the U.S., as one might have expected, but rather the Montreal Auto Show in Canada. 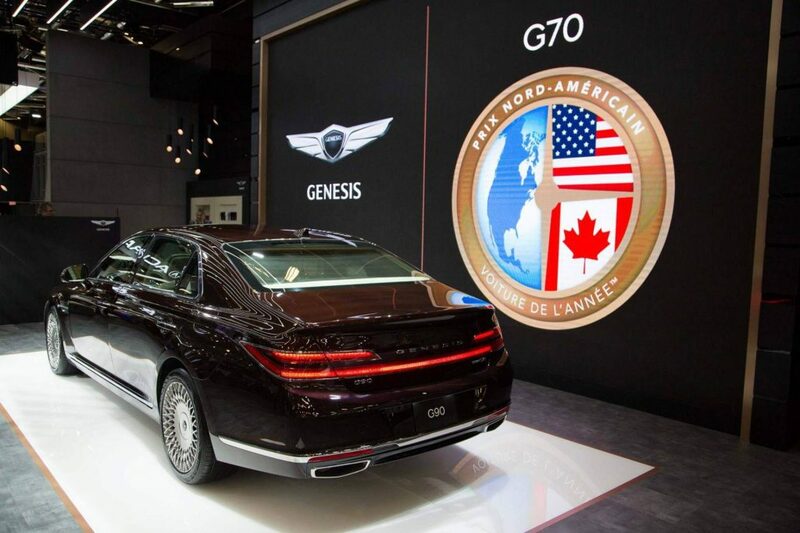 The Genesis G90 that will go on sale in the United States and Canada this summer looks identical to the Korean-spec vehicle, bar the North American-specific side marker lights. The Korean brand’s flagship does feature some changes for North America, though, and they are mainly related to the engine lineup. In the United States, the standard choice is a 3.3-liter twin-turbocharged petrol V6 rated at 365 hp (370 PS) and 376 lb-ft (509 Nm) of torque. However, in Canada, this engine will only be available via special order. 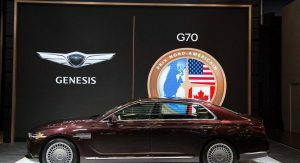 Besides the V6, the 2020 G90 can be ordered with a naturally aspirated 5.0-liter V8 rated at 420 hp (426 PS) and 383 lb-ft (519 Nm) of torque. The eight-cylinder engine will be the standard choice for the Canadian market. The facelifted Genesis G90 comes with an eight-speed automatic transmission and standard AWD for the V8 model. 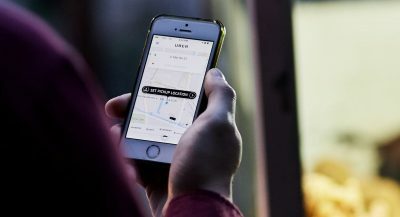 The system features an electronically controlled transfer case that can vary the front-to-rear torque split on demand or according to driving conditions. According to Genesis, the 2020 G90 offers “the smoothest possible ride comfort while retaining engaging dynamics” thanks to the multi-link suspension design and the Adaptive Control Suspension system with electronic damping control sourced from Sachs/ZF. 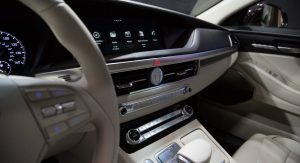 The Korean luxury brand also claims NVH levels have been improved compared to the previous G90 thanks to the introduction of special sound-absorbing materials throughout the cabin and sub-structure of the car, the use of laminated glass on all windows and the new standard Active Noise Cancellation (ANC) system. The area where engineers made the most enhancements is technology. 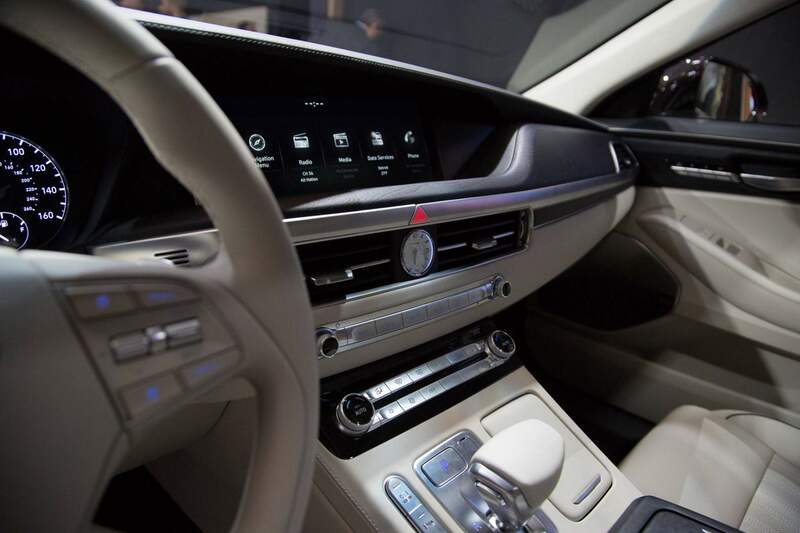 The G90 gets a re-engineered 12.3-inch central touch screen that incorporates a new Graphic User Interface (GUI) and is compatible with both Apple Carplay and Android Auto. 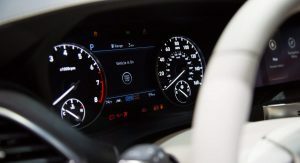 Furthermore, a wide range of safety assistance systems is now offered as standard, including Lane Follow Assist (LFA), Highway Driving Assist (HDA), Blind-Spot View Monitor (BVM), Rear Cross-Traffic Collision Avoidance-Assist (RCCA-A), Forward Collision Avoidance-Assist (FCA-A), and Safe Exit Assist (SEA), while a passenger’s knee airbag has been added as well. As for the new equipment, Genesis mentions a 22-way power driver’s seat approved by the German campaign for healthier backs (AGR), a 16-way front passenger’s seat (both heated and ventilated), as well as 12-way rear outboard passenger seats (14-way for the right seat position on the V8 model). The rear seats are heated as standard and ventilated on V8 models. Quality-wise, the cabin features quilted Nappa leather, new contrast piping for the leather-wrapped dashboard, higher-quality switchgear, and Natura wood trim with an exposed grain texture. Pricing will be announced closer to the 2020 G90’s market debut this summer. Looks more pimped out than the last one. 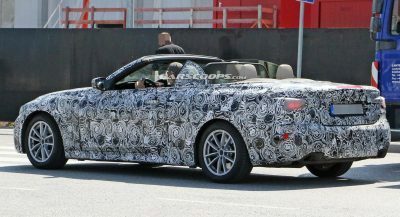 Funny how there are no front-end shots of that obnoxiously large grille (surprised? NOT). And why does it say “G70” above it? I absolutely love this car. Divinely unique. Same here. Except for the front grille and the rear tail lights. There are both comical. The rest is stunning. Really Bash? Well to each their own. I absolutely love the design language. Well the interior is on par, deserves some award or something. I give it that! And I love the side profile. Now since you mentioned it. It makes a perfect sense as a 2002. Looks decent. Good luck to them! Elegant, non-polarizing styling and classy interior with physical controls. I don’t care what badge is on the hood, this is how you do luxury. Too bad most badge snobs will never set foot in a Genesis showroom. Not awful. There is a bit of distinctiveness to the front end design. The interior and most of the exterior isn’t very interesting. The wheel choice here isn’t good. I doubt this will be a huge seller. It won’t sell many more than it currently does, which is to say under 100/month. Especially with all the engine failure/fires/recalls going on with Hyundai these days (other engines, but still). And depreciation is hideous. A genuine luxury car. Awful video though. Like… back up a bit. Sheesh! I like everything but the front end. That thing looks like a wannabe Maybach from last generation. I really don’t like it. The pre-facelift was way better in my opinion. This looks like they took a bunch of different scraps from other brands and stuck them on this. I mean you got a GS’s interior, an extended Acura grille, and Lincoln taillights. I’ve never seen originality with this brand – even their logo looks like a want to be Bentley logo. I thought it was going to grow on me; I was terribly mistaken. The more i see this car the more i adore it, and i’ve liked it since the debut. It might be polarizing, but i love the futuristic yet stately looks it has going on. I think that is what they were going for as well: understated futuristic. But I think it doesn’t cut the mustard in the class it is trying to fit in. I’m afraid it will not make it. CS commentators are very weird and lack of taste. 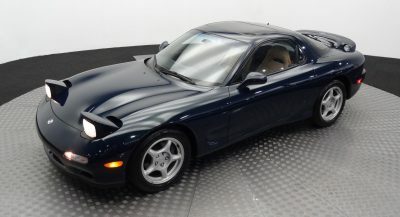 If you like enormous depreciation, this is the car for you! Exactly. I can’t help but wonder who the target audience is. I was shocked at how ‘cheap’ the predecessor to this have become! This is a rich person throw away car. Nobody cares about depreciation. Most vehicles in this class don’t hold their “value” because they are expensive to repair. A rich guy will buy one of these if it’s the “in thing” to buy and then dumps it when the next “in thing” comes along. It’s the poor sucker with little money to spend that wants to feel like a big shot that buys these used real cheap and then gets a shock of his life when it needs repair. Extremely terrible aesthetic. All the worst traits of the late, unlamented barge-class. Please go away, thank you. This thing is God-awful hideous! I would rather have a Lincoln MKT and it doesn’t look too much better, but I will have to compromised for an MKT or even a KIA RIO than to take this ugly mess. This car is a total mess! I haven’t seen them in real life but they do look bad in the pics. Reminds me of my parents’ old 1997.5 Infiniti Q45. Also in maroon (almost brown), but that one came with gold badging, too. Super thick C pillar, pepper grinder wheels, awkward detailing. Yep, all present on the G90. And a lot of those details felt dated 20 years ago. It looks like something designed for a third-world dictator. Genesis really step up their game on their full size sedan as well as increase their price for it too. It is nearly the same as a Lexus full size sedan. What a stupid looking car. Loser luxury. A fine looking luxury car, BUT that grill??!! Last year’s front end looked fine. I guess the designers got restless.